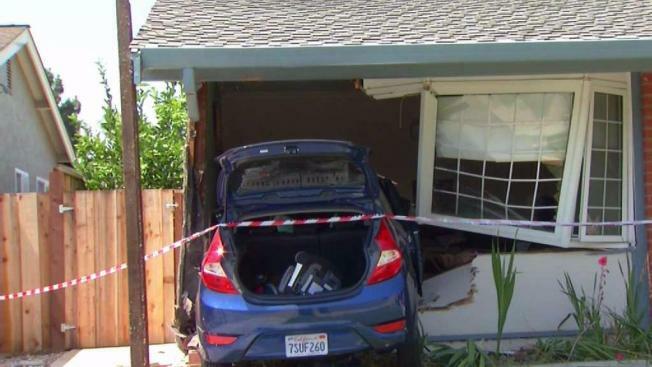 An attempted burglary and police chase on Tuesday ended with the suspects' car barreling into a Fremont house. Three suspects were taken into custody near a house on Isherwood Way and Nicolet Avenue, where a number of police cars and shocked neighbors were gathered. "It was really bad," said neighbor Archana Sharma. "It was like a blast. That's (what I) thought: something really bad is happening on our street." Fremont police said they got a call that three people might be robbing a nearby house. An officer arrived at the scene, but the suspects took off. "That officer attempted to make a traffic stop on the car," said Geneva Bosques with the Fremont Police Department. "The car failed to yield and a short pursuit occurred." The chase ended when the driver drove onto the cul-de-sac and plowed into the house at nearly 70 mph. Fortunately, no one was home at the time. The couple that owns the house said they have two children who were in summer camp at the time of the collision. No injuries were reported. "We'll figure out something," said resident Silpa Jonnalagadda. "We don't know yet. It's just sinking in." The house is located near Brookvale Elementary School and the homeowners are already working on remodeling the building.